Project Nursery reader Dana recently asked us about finding the perfect upholstered headboard for her daughter’s new big-girl room. (Saw SATC last night and didn’t Charlotte’s daughter Lily have the most darling pink dot upholstered headboard?) While Dana likes the headboard collection by Serena and Lily she wondered if there were other options out there with a similar look for a little less. Say sub $800 dollars? The answer Dana is a huge YES and you aren’t going to believe the stuff we found. Hope this helps your search, we had fun investigating for you! 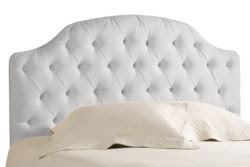 This Camden Tufted Headboard from Ballard Designs is that classic tufted style for as little as $329. They have about 50 different fabrics to choose from ranging from solids to florals to bold patterns. Try this crisp white or green version to brighten any little girls room. Here’s PB Teen’s Lewis version of the tailored ribbon border upholstered headboard and it happens to be on sale for $159. The ribbon detail is offered in apple green, hot pink or chocolate brown. And believe it or not even Target has a few options. 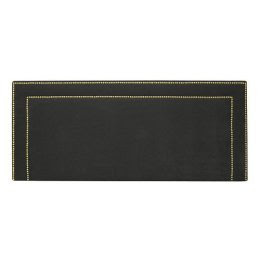 This dark upholstered headboard comes in rich black or bold red, accented by chic nail heads. It was featured in Domino Magazine this past month and would be a perfect fit for a little king. 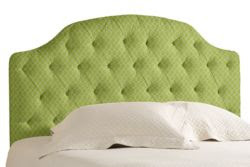 If you want to go outside the upholstered spectrum this Open Carved Headboard from Brocade would add total elegance.